A MARCAPOLITICA analysis found that the 11 other TPP countries are now involved in a whopping 27 separate trade negotiations with each other, other major trading powers in the region like China and massive blocs like the EU. Those efforts range from exploratory conversations to deals already signed and awaiting ratification. Seven of the most significant deals for U.S. farmers were either launched or concluded in the five months since the United States withdrew from the TPP. He and other agricultural businesspeople and workers have reason for concern. Contrasting sharply with Eagle Grove’s sleepy main thoroughfares, Tokyo’s Shibuya Crossing is considered to be one of the busiest intersections in the world. While slow and small, Iowa towns such as Eagle Grove help supply much of the pork Japan imports. On July 6, the EU, which already exports as much pork to Japan as the United States does, announced political agreement on a new deal that would give European pork farmers an advantage of up to $2 per pound over U.S. exporters under certain circumstances—a move which, if unchecked, is all but certain to create a widening gap between EU exports and those from the United States. European wine producers, who sold more than $1 billion to Japan between 2014 and 2016, would also see a 15 percent tariff on exports to Japan disappear while U.S. exporters would continue to face that duty at the border. For other products, the deal essentially mirrors the rates negotiated under the TPP, which the United States has surrendered, giving the EU a clear advantage over U.S. farmers. The EU’s deal is all the more noteworthy because American farmers were relying on the TPP—to which the EU was not a member—to give them an advantage over European competitors. But in a further rebuke to the United States, Tokyo decided within a matter of weeks to offer the European nations virtually the same agricultural access to its market that United States trade officials had spent two excruciating years extracting through near-monthly meetings with their Japanese counterparts on the sidelines of the broader TPP negotiations; the United States is now left out. The EU, which also recently inked a deal with Vietnam, is now moving forward with talks with Malaysia and is in the process of modernizing a pre-existing trade deal with Mexico. Meanwhile, a bloc of four Latin-American countries—Mexico, Peru, Chile and Colombia, known as the Pacific Alliance—is quickly becoming the leading force for free trade in the region, announcing near the end of June it would commence its own negotiations with New Zealand, Australia and Singapore, heedless of its neighbor to the north. On its own, Australia, which in 2015 cut a deal to undersell the United States in beef exports to Japan, announced another round of scheduled tariff cuts with Japan. Without the TPP, Australian ranchers eventually will enjoy a 19 percent tariff advantage over U.S. competitors. Australia is also prioritizing the conclusion of trade talks with Indonesia, the largest nation in Southeast Asia by gross domestic product. 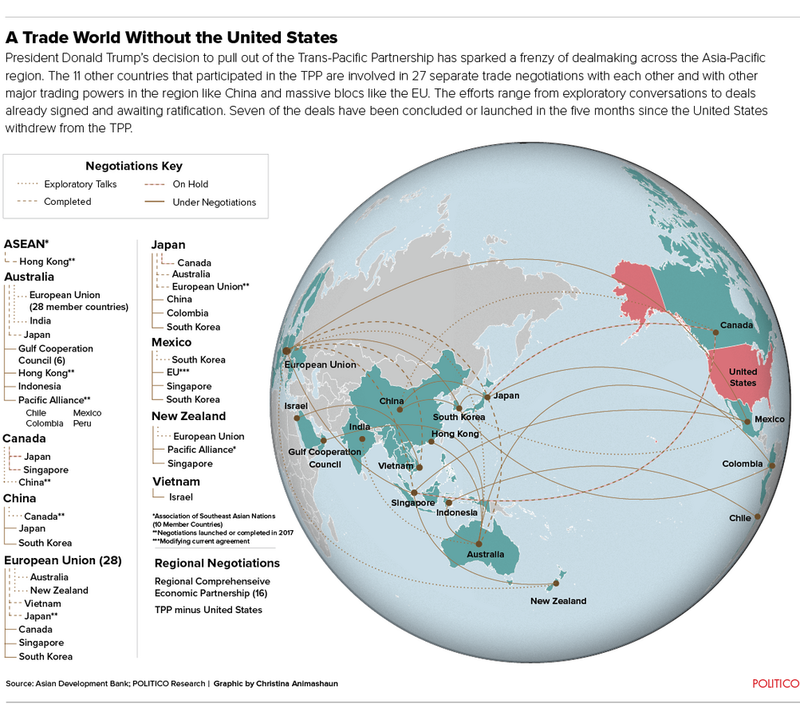 The remaining 11 TPP countries have already met two times, with a third meeting planned, to move ahead with the revival of the deal without the United States. The so-called TPP-11 would be in direct response to Trump’s trade policy. Economic forecasts already show projected gains for countries involved. Canada, according to one estimate, could permanently gain an annual market share of $412 million in beef and $111 million in pork sales to Japan by 2035, because lower tariffs would enable it to eclipse America’s position in the market. As China, which was never a part of the TPP, senses blood in the water, it is moving quickly to assert itself, rather than the United States, as the region’s trade arbiter. China is aiming to close talks by the end of this year on its behemoth Regional Comprehensive Economic Partnership—a trade agreement involving 15 other Asia-Pacific countries. None of these deals are yet in effect. But already there are signs that competitors are gaining market share over U.S. producers in the post-TPP landscape, as Pacific nations take a closer look at alternatives to U.S. exporters. Over the first five months of 2017, U.S. exports to Japan of chilled pork, which is preferable to frozen meat, are up 2 percent over the previous year. But exports of chilled pork from Canada, a prime competitor, are up 19 percent. Likewise, in frozen pork, U.S. exports are up 28 percent. But exports from the EU, the leading competitor, are up 44 percent. For his part, Trump once promised a slew of “beautiful” deals to replace the TPP, but his administration has yet to lay out a detailed strategy. U.S. Trade Representative Robert Lighthizer told lawmakers that an analysis is underway to determine where it makes most sense to pursue negotiations. Lighthizer acknowledged that even Japan, at least for the time being, may not be interested in one-on-one negotiations with the U.S.
Lighthizer declined to comment for this report, and the White House directed questions to the Agriculture Department. But Tim Murtaugh, spokesman for the Department of Agriculture, which is more overtly pro-trade than other pockets of the administration, said in a statement that “Secretary [Sonny] Perdue is committed to expanding our playing field for American agricultural exports,” and has met with his counterparts in Canada, Mexico and China. Murtaugh cited administration gains in “getting beef into the Chinese market” and securing access for American rice growers to China, “the largest rice market in the world.” Both moves came out of Trump’s meeting with Chinese President Xi Jinping at Mar-a-Lago, though they had been worked on intensively during the Obama administration. “It goes right along with the secretary’s new motto for USDA, ‘Do right and feed everyone,’” Murtaugh wrote. He made no mention of efforts to fill in the gaps left by the country’s withdrawal from the TPP, which are more in Lighthizer’s purview. That leaves workers in 13,000-person Wright County, whose survival depends largely on agriculture, with relatively few signs of optimism. Trump’s decision to walk away from the TPP has stoked uncertainty about U.S. trade policy and, more notably, the president’s commitment to rural America. “He fooled a lot of people,” said Sandy McGrath, mayor of Eagle Grove, who is not affiliated with any party and did not support Trump. In Wright County, a trainload of corn can be in Mexico in three days, tens of thousands of hogs are being raised just for export to Japan and farmers routinely travel to far-flung places like Indonesia and the Philippines to market their goods. 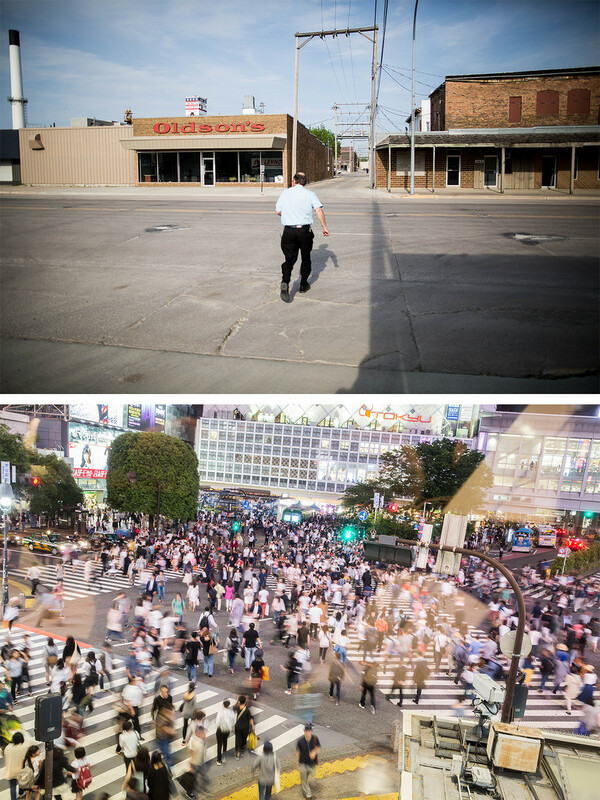 This community roughly 100 miles north of Des Moines, checker boarded with corn and soybean fields and dotted with silos, may seem far from the raging debate over globalism sparked by Trump’s presidency, but it’s actually right at the center. Sandy McGrath, the mayor of Eagle Grove, is shown at Rails Bar and Grill, which she owns and operates. The area’s “skyline” is punctuated by soybean processing facilities like the one shown here. Farmer Jerry Maier, right, and Jim Christ chat inside Christ’s furniture store. The county’s residents are grappling with life under a Trump presidency and all its unanswered questions: Will the president’s next tweet about trade send commodity prices crashing? Will Trump ever follow through on his promise to create new opportunities through bilateral trade deals? And, even more pressing: Will the new plant that Prestage is building be able to hire a second shift of workers, helping families who have struggled through the recent agricultural downturn? “I would not say I trust the president’s judgment right now,” said McGrath, a registered nurse who grew up on a nearby farm and owns one of the town’s main watering holes—Rails Bar and Grill, named for its proximity to the rail line that that carries cars loaded with grain and feed. 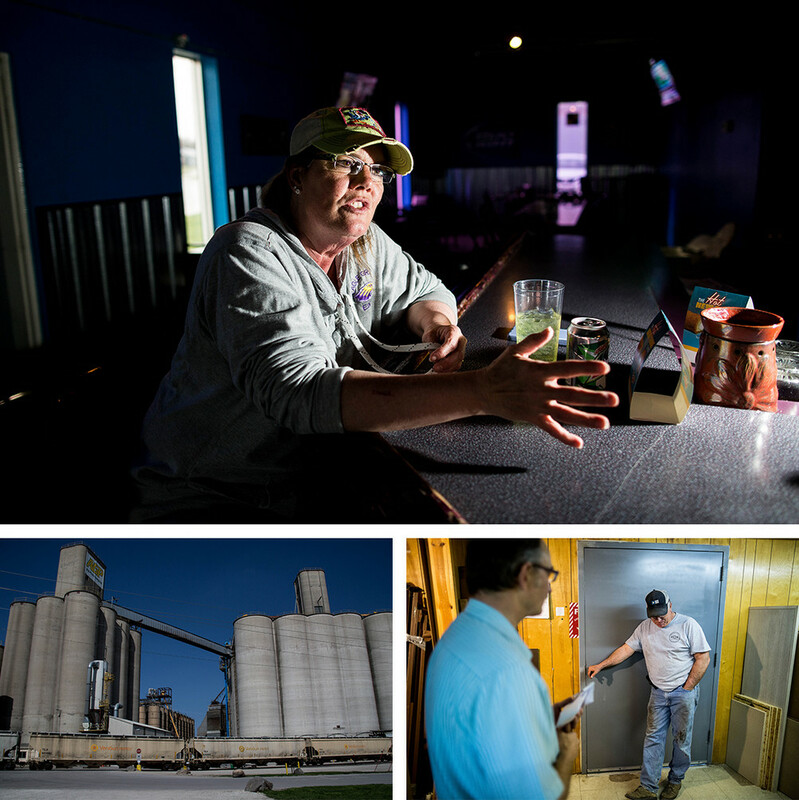 Eagle Grove’s skyline is already punctuated by feed grain elevators and a soybean processing facility. Now it’s further staking its future on Prestage’s 700,000-square-foot pork processing plant, roughly five miles south of town past the Dollar General, the Family Table restaurant and a Ford dealership. The plant represents an opportunity not many Midwest towns the size of Eagle Grove are afforded given today's economic realities. McGrath said the plant will bring much-needed jobs to the area, which has had a dwindling population for years. From its 1970 height of 4,489 people, the town suffered a 31 percent decline in population to 3,427 in 2016. Now Eagle Grove is expecting at least 200 of the 900 workers the plant will initially employ to find housing in the town. This would give a sorely needed boost to retailers and service providers, as well. But the plant’s success will depend largely on export opportunities. More than 26 percent of the pork produced in the U.S. in 2016 was exported to foreign markets. And more than $1.5 billion of the nearly $6 billion in U.S. pork exports in 2016 headed for Japan. “At the time those investment decisions were made, the U.S. had never turned down a free trade opportunity,” said Dermot Hayes, an agricultural economist at Iowa State University, referring to the Prestage plant and other pork-industry investments. “I’m scared to death,” said Ron Prestage, referring to Trump’s decision to pull out of the TPP. The family-owned Prestage Farms is building a pork processing facility outside Eagle Grove that depends on a robust export market. Hayes said the livestock industry had in its sights a future of expansion amid soaring export growth. After Trump’s withdrawal from the TPP, “that has pretty much disappeared,” he said. Most in the industry expected a coming boom from exports as a result of TPP, with continued strong sales made possible by NAFTA. Vietnam, another growing market where U.S. producers were set to expand sales of organ meat and other items not easily sold domestically, was prepared to eliminate its tariffs altogether under TPP. Now, the tariffs remain and Prestage—and all of Eagle Grove—are holding their breath. Prestage said his company’s plant should be operational by the fall of 2018, but any move to add a second shift or expand production will largely depend on new trade opportunities. Exuding gentle defiance, Prestage said even if he had known the TPP would fail, he still would have gone ahead with the plant. His family’s business raises, mainly through contract growers, more than 1.5 million hogs in Iowa alone. Consolidation in the meatpacking industry has forced companies like Prestage to sell hogs to a few major players like Tyson Foods and JBS. “It was time for there to be some modernization in the U.S. packing industry,” he said. With future export opportunities in question, the success of the plant will now be tied to what business it can displace from less efficient and older processing facilities. It also will face competition. The Prestage plant is one of two new major pork processing plants being built in Iowa and one of five new facilities going up nationwide. “I sure hope I’m right about that,” he added after a pause. Ask anyone involved in the county’s agriculture sector their thoughts on Trump as president and his stance on trade, and you get a carefully thought-out response. Like many of those in Trump’s rural base, they are distrustful of the coastal elites who are blocking his agenda, even as they wish that he would alter his own abrasive style and think more about those who got him elected. “I still believe what he is saying he is going to follow through on, but his management style isn’t quite how at least people in the Midwest do things,” said Stu Swanson, who farms corn, soybeans and pork outside Galt, a tiny hamlet near the center of the county. “There’s a Midwest style and there’s his style,” he said from his living room, where the panorama from the windows is dotted by the white-roofed livestock barns in the distance. Ground is prepared to host Prestage’s 700,000-square-foot pork processing plant south of Eagle Grove, Iowa. Swanson acknowledged his own household is split over its support for Trump. Trump, he figured, would be the best positioned to tamp down the rising health care costs for his own family and his one farmhand that he believes to be connected to the Affordable Care Act. But on trade, Swanson was less sure where Trump drew the line between campaign-trail bluster and real action. There was, he thought, far too much at stake for his rural base to make any rash decisions. Then, three days after he was sworn in, Trump made good on a promise to drop U.S. support for TPP. “I was disappointed Trump kind of broadly wiped out TPP before there was even a discussion,” Swanson said. Jerry Maier, a Wright County corn and soybean farmer who supported Trump, said he feels the same way. “If you’re at the table and nothing happens, that’s one thing. But if you aren’t even at that table, that’s frustrating,” he said. The downward trend of commodity prices has been a lingering reality for the third-generation farmer who lives just outside Eagle Grove. 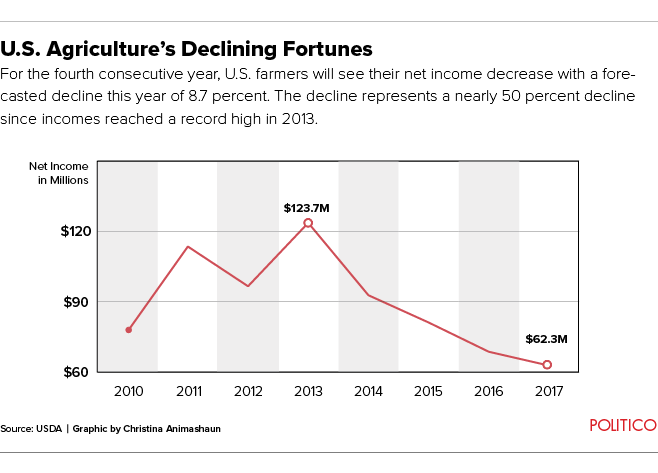 The USDA’s annual farm income report forecasts that net farm income will drop this year by 8.7 percent, compared with 2016. Incomes have been decreasing steadily since 2013 when they hit an all-time high of more than $120 billion. The forecast for this year projects net incomes down to little more than $62.3 billion. Maier, for one, has had to find new ways to earn extra income from grinding tree stumps to hauling gravel using trucks that usually carry grain. After a wet planting season this spring, he expects to once again barely break even on his crops. “Farmers are pretty resilient about making no money for a few years, but you gotta make money at some point,” he said. 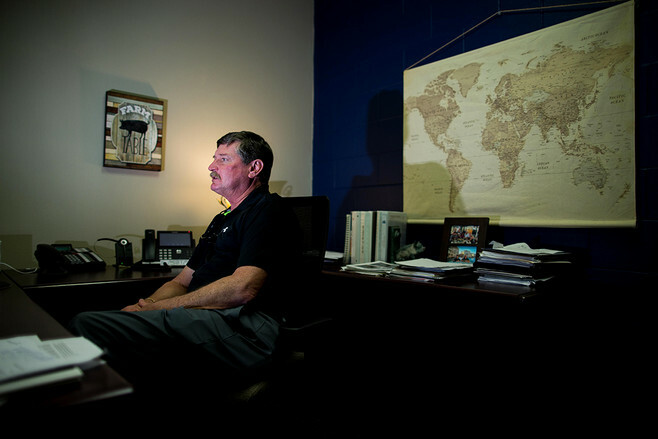 Maier is as vigilant as any commodity trader, scrutinizing corn and soybean prices multiple times a day as alerts come in on the smartphone he carries on his belt. He’s also aware that any extra margin on his crops, barring any unforeseen demand domestically, will largely depend on new overseas markets. He recently hosted a contingent of South Korean grain buyers on his farm and traveled to the Philippines and Indonesia last year to seek new contracts for Iowa farmers. In April, when Trump was on the verge of withdrawing from NAFTA, Maier said he watched corn prices plummet in anticipation of the president’s decision. Trump relented, at the request of Perdue, the agriculture secretary, who appealed to the president with colorful maps showing the president's base was largely concentrated in states that heavily rely on agriculture. Ultimately, Trump agreed to renegotiations with Canada and Mexico instead. But Maier remains wary that, despite pledges by the administration to "do no harm" for agriculture, the mere act of reopening the deal with Canada and Mexico, the two largest destinations for U.S. agricultural exporters, could mess up what has been a very good thing for American farmers in the Midwest. “Farmers are willing to open up NAFTA, but if we open up NAFTA, there's the risk of going backwards,” he said. Wright County produces 800,000 hogs per year and is one of the top 20 pork-producing counties in the country. Put those pigs next to the more than 6.5 million egg-laying hens (the county is first in the nation in egg production) and that creates a huge demand for corn and soybean for feed. The supply chain from field, to feed, to animal has created a massive livestock industry that doesn’t always find demand among American consumers. The dimming of any new trade opportunities or the disruption of existing ones creates a ripple effect not only vertically along the direct farm value chain but horizontally into the economic welfare of the surrounding community. “If the farmers have a bad year, we all have a bad year. If the farmers have a good year, we all have a good year,” said Melia Hansen, a hair stylist on Eagle Grove’s main street. Successfully growing a business in today’s agricultural economy has become more reliant on trade as farmers consolidate and massively scale up their production to better compete. In 1940, the Agriculture Department census found that the average Iowa farm was 160 acres. By 2012, when the last census was conducted, the average acreage in Wright County was 464. The success of the community as a whole is growing more reliant on the fortunes of fewer farmers growing even more grain and livestock. The economic outlook for Wright County would certainly be a lot less hopeful without the Prestage plant, but there is broad recognition that trade will largely drive any future growth, said Bryce Davis, director of the county’s economic development department. 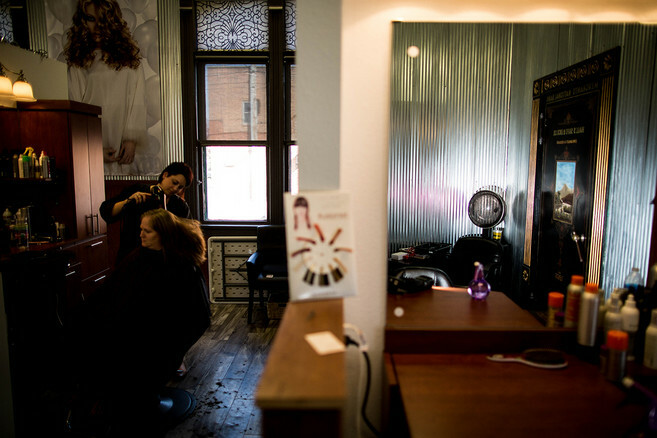 Customers have their beauty needs taken care of at Reflections Salon, a renovated bank building along Broadway Street in Eagle Grove. As commodities like corn and soybeans continue to languish, Davis excitedly talks about the export potential of “value-added agriculture” beyond pork production. 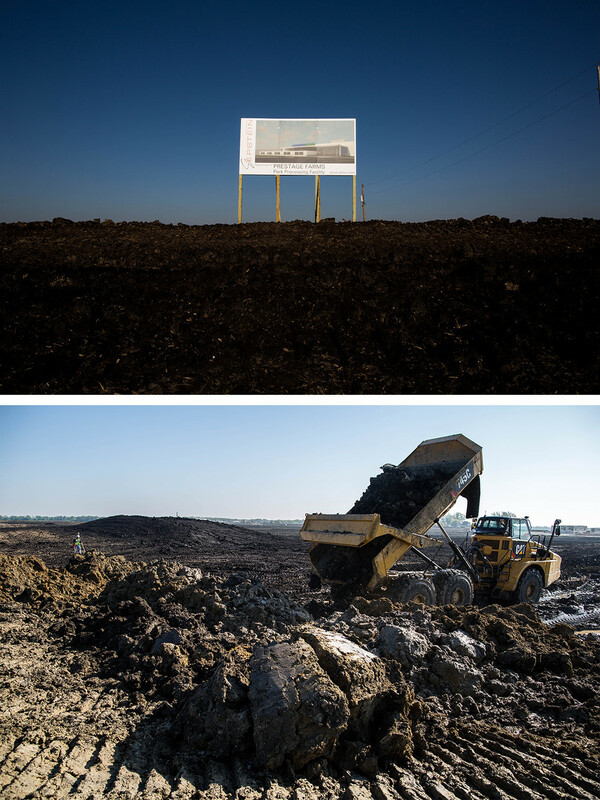 After an earlier proposal to build Prestage’s plant about 70 miles away near Mason City was turned down, Davis sent an unsolicited email to the company to see whether they’d be interested in scoping out Wright County as a possible location. Now, fresh off the major coup of reeling in Prestage, the young, energetic economic development professional sees more opportunity in everything from aquaculture to getting more farmers to grow hops to harness the new global fervor for craft beer. He dreams of a time when the county could become a seafood exporter 1,000 miles away from the closest ocean. The concept is already bringing success to nearby Webster City where a company called VeroBlue is expanding its operations for raising barramundi, a flaky white fish native to Australia. The company, which already farms fish in old pork production facilities, acquired the building that once housed the town’s primary employer, an Electrolux washing machine factory that shut down in 2011 and relocated in Juárez, Mexico. “We know we need these trade agreements in place to provide an opportunity for Iowa farmers to sell their products,” Davis said. The Obama administration, backed by a large cadre of free-trade Republicans, used that reality to grow support for the TPP among businesses and agricultural interests eager to grab a better foothold in a fast-growing area of the world where the U.S. has few formal trade deals. 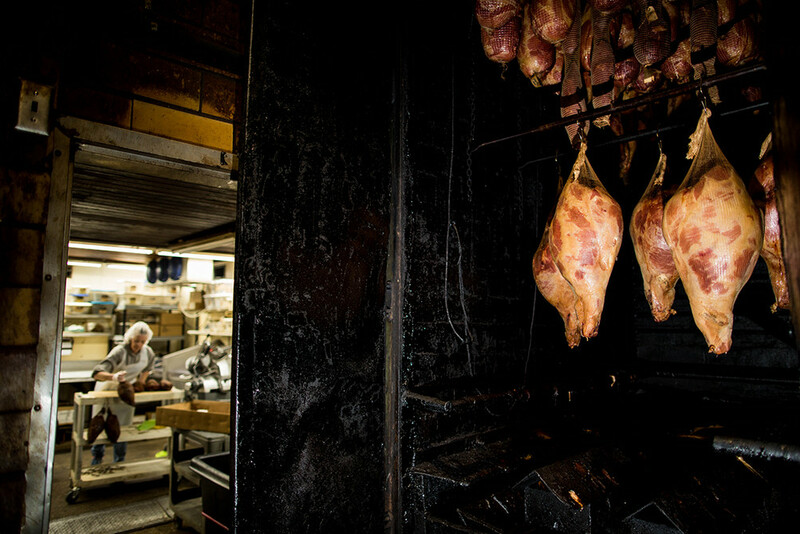 Workers at Lewright Meats prepare hog products for sale at their Eagle Grove shop. The family-run business specializes in custom processing for beef and pork farmers while operating a popular deli up front. But through the slow churn of negotiations, the dazzlingly complex deal among 12 countries soon fell victim to time and circumstance. After more than five years of talks, bleary-eyed trade negotiators were finally able to close the deal at an Atlanta hotel on October 5, 2015. But the agreement quickly became mired in election politics. Labor unions and blue-collar voters declared it to be a successor to NAFTA, which was blamed for the loss of factories. And while the U.S. trade commission predicted the deal would be broadly beneficial to the overall economy, some areas including food and agriculture were predicted to score more gains than others. Even as supporters of the deal insisted it would put U.S. manufacturers on a stronger footing versus overseas competitors by enforcing higher labor and environmental standards, Trump and Bernie Sanders used anti-TPP fervor as a key plank of their campaign platforms, declaring that it would cost America jobs. Even Hillary Clinton, normally a supporter of freer trade, turned on the deal, saying she wanted to negotiate better terms. Trump escalated his rhetoric on trade after the primaries and Congress, which has final say on trade deals, shied away from bringing TPP up for a vote. After Trump’s victory, the fate of the deal in the GOP-controlled Congress was all but sealed as Republican lawmakers put it aside to concentrate on tax reform and a bid to roll back Obamacare. But even as Iowa was voting for Trump by 51 percent-42 percent, its farmers were looking to Asia as their savior. Throughout the fast-growing Asia-Pacific region, an expanding middle class is demanding higher-quality protein—causing enormous demand for meat. U.S. pork producers can find Asian buyers for just about everything cut out of a hog carcass—from the highest-priced loin to the cheaper organ meats that are hard to sell to U.S. consumers. The boom in Asia is so powerful that, even with the dim trade outlook stemming from its pullout from the TPP, U.S. pork exports continued to grow through April of this year. In the first four months of 2017, 27.5 percent of total U.S. pork production was exported, up from 24.4 percent last year. Exports to Japan in April were 5 percent higher than a year ago by volume and up 10 percent in value. The U.S. Meat Export Federation has pushed an aggressive marketing campaign for pork and beef, portraying American meats as premium products. 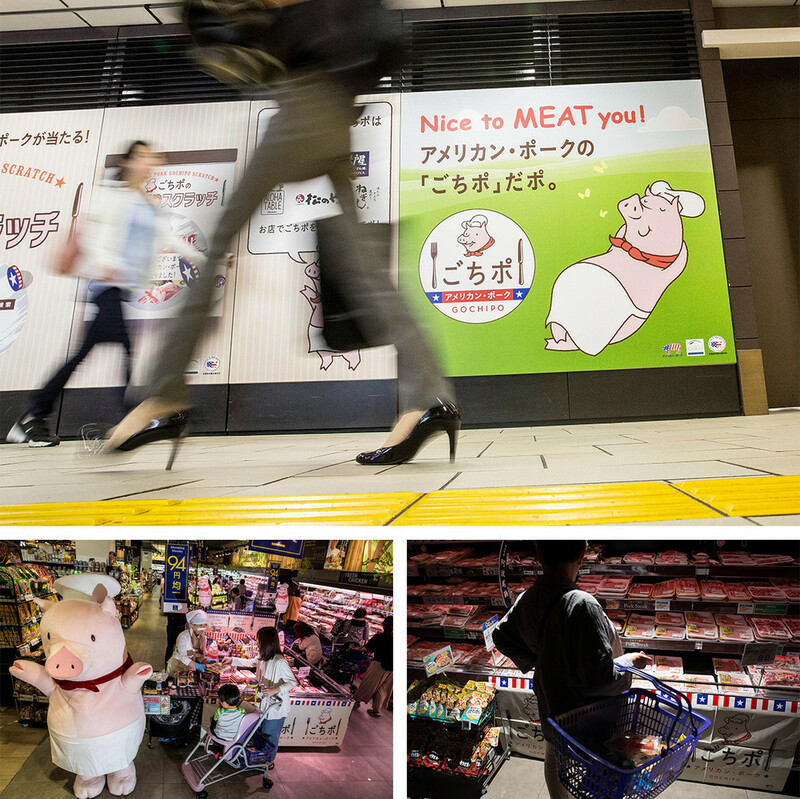 In Japanese supermarkets, American pork is branded with a logo featuring Gochipo, a cute animated pig that sometimes even makes appearances in mascot form to encourage shoppers to buy premium, thick cuts of U.S.-produced pork. But it could soon just be a matter of time until consumers in those countries will choose a lower-cost product. Growth in Canadian chilled-pork exports to Japan is already outpacing those of the United States, as buyers in Japan have already been looking to diversify their sources after a disease outbreak spiked prices in 2014 and a West Coast ports shutdown further roiled the market in 2015. If Canada clinches a deal with Japan through a revived TPP where it would gain a price advantage, little would stop Canadian pork from overtaking U.S. share of the market, which has already dipped from 70 percent in 2012 to 55 percent this year. The EU, a major pork exporter, is also closing in on both the Japanese market and fast-growing Vietnam. Japan ended up offering the EU the same deal on pork it did to the United States under the TPP after the EU gave Tokyo favorable access for its cars. In Vietnam, frozen pork imported from the EU will be duty-free seven years after the deal with Brussels goes into force. The most immediate example of U.S. producers losing out is the case of Australian beef. In its lobbying drive on the TPP, the U.S. beef industry at one time even kept a website complete with a counter continuously ticking off the amount of sales to Japan it was losing to Australia. Now, Australia is speeding up the clock. Australia's tariff advantage was boosted even more after Japan imposed an additional 11.5 percent tariff on imports of U.S. frozen beef on August 1. U.S. exports of the product had risen to a level of triggering a “safeguard” measure meant to protect domestic cattle producers. That tariff hike won't apply to Australia since it has a trade deal with Tokyo and wouldn't have applied to the United States if the TPP were in place. Australian exports to Japan are expected to catch up with the United States, with Australia enjoying a tariff this year of 27.5 percent compared with the 50 percent the United States now faces with the safeguard in place. The TPP would have cut tariffs to 9 percent for both Australia and the United States. After years of drought, Australia’s ranchers are rebuilding their herds. Although the scale of Australia’s production may never match that of the United States, Finucan said there is increasing demand for the type of grass-fed beef Australia is best known for producing. Sitting comfortably on a couch overlooking the expanse of sea from the lobby of a beachfront hotel in Vina del Mar, Chile, Australian Trade Minister Steven Ciobo has his gaze fixed across the Pacific. It’s March 15 and, a few hours previously, the 11 current TPP countries were finally able to offer a unified response to Trump’s announcement from January: Don’t expect the trade agreement to fade away. The meeting on Chile’s coast represented a major turning point on trade for Asia-Pacific countries facing life in the Trump era. Not only did the remaining TPP countries reaffirm their commitment to retain the benefits of the deal, but Chile and its Latin American trade allies in the Pacific Alliance announced their own efforts to advance regional trade integration by pursuing trade deals with other countries. “We continue to engage with the world,” Ciobo said matter-of-factly, while sipping a Coke. He said his highest priority was completing negotiations for a trade deal with Indonesia, Southeast Asia’s largest country, where the United States has no agreement. Leaders from Australia and Indonesia agreed on the sidelines of the G-20 summit in July to reach a deal by the end of the year. 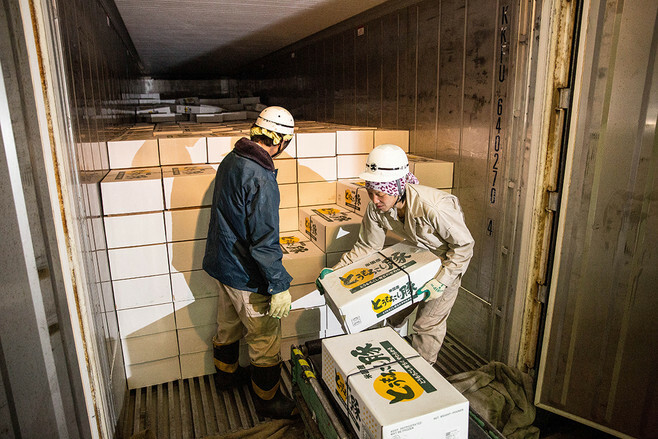 Workers offload a shipment of pork from a Perry, Iowa processor as it arrives at a massive cold storage facility along the shipyards in Tokyo, Japan. The same sentiment came from New Zealand Trade Minister Todd McClay when he was in Washington in June for his first one-on-one meeting with Lighthizer. Even as senior trade officials from countries in the Pacific region waste no time acting on new opportunities created by America’s absence, they recognize it’s still early days for the Trump administration on trade. “In the first few months of an administration and the first few weeks of a USTR being in place, we need to show the understanding and courtesy to allow that strategy and policy to develop,” McClay said. But despite Trump’s intense personal interest in trade, the White House has been slow to build the dream team of negotiators the president promised on the campaign trail. Lighthizer, who once served as a deputy U.S. trade representative under President Ronald Reagan, was confirmed on May 11. The people tapped to serve in the agency’s three deputy positions await confirmation, as does the administration’s pick for chief agriculture negotiator. As far as the administration’s strategy to get there, Grassley, who still owns his farm in Butler County, Iowa, said he hasn’t gotten much direction. 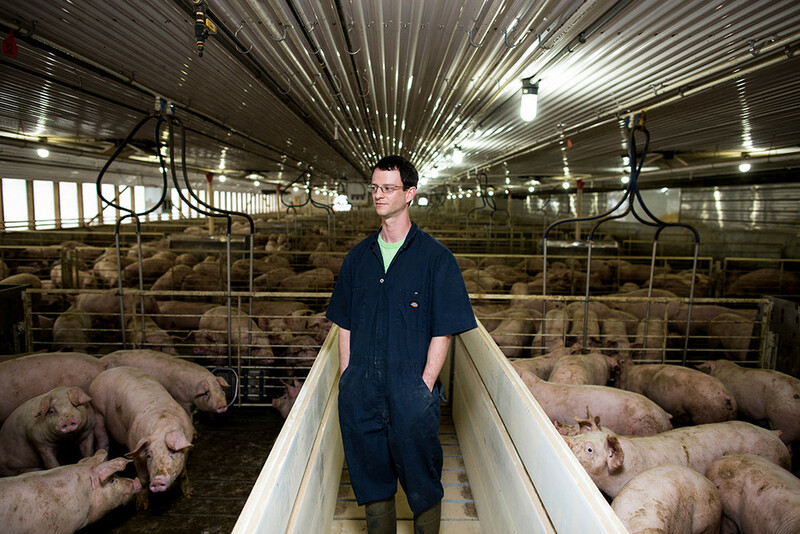 Iowa farmer Grant Woodley inside his 4,800-head hog confinement facility near Clarion, Iowa. For Grant Woodley and the 4,800 hogs he is raising for export to Japan, that uncertainty is worrisome. Woodley and his wife, both Lutheran ministers, moved back to Wright County from Des Moines a few years ago to help with his family’s farm. They made a major investment two years ago in a state-of-the-art livestock facility, knowing that the margin on soybeans and corn alone wouldn’t provide a sustainable source of income to keep the farm, which has been in his family for more than 100 years. His current contract has him raising hogs for the Japanese market. That involves feeding the animals a diet free from certain additives and following more restrictive guidelines on antibiotic use. He knows any profit he might get on futures contracts for any hogs raised for export will largely depend on whether the trading relationships tilt in favor of the United States. “The world is going find it wherever it’s cheapest,” said Woodley, who made clear he did not support Trump in the election. Stability and predictability were two key principles for Woodley. So far, he doesn’t see any of that coming out of the Trump administration when it comes to his trade policy and ability to strike new deals.